I just returned this morning from anouther great river float. We did the King Salmon river over near Dillingham. Its a short float of about 50 river miles. Easy water, Crystal clear, and 4 kinds of Fish that were eager to strike about anything in the tackle box. Grayling were an every cast catch if you wanted. Rainbows were World Class with several over 25 inches and many over 20 inch range. The Char were beautiful with fall colors of Dark Green, brilliant red spots and White lines along the bottom of the fins and belly. an endless stream of Silvers in every water deep enough to keep them submerged. Not much for Game along the river, unless you are talking Brown bears. We floated up on 11 brown bears throughout the 50 miles. 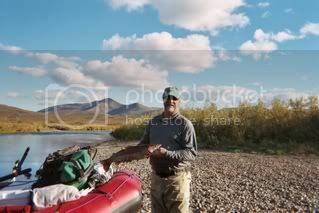 The river banks and grass was matted flat the whole distance from the Bears constant trolling for an easy Salmon catch. One poor old Caribou had been attacked by a Brown Bear and had escaped somehow but had wounds so severe to its hind quarters that it was Dead, but did not know it yet. It tried to cool its wounds in the river, limped out of the water to an Island, laid down and became part of the Brown bears diet that night. We had no trouble ourselves with Bears, as we kept a constant vigil watching to not surprise them, especially the Mom and her Cubs. The curious Cubs made it a bit uncomfortable when they approached us even though we tried to talk them into going the other way. Momma bear tried to woof them to behave, and for a moment I thought we may end up skinning out a full sized rug and a couple of Toilet seat covers. No trouble in Camp at night. My solution in Bear infested places is to bring along one of those "Bear Attack " books, and let the Chechako in camp read a few stories from the book, That way I can sleep at night and he is wide awake standing guard. Anyway.. as we always say..
the trip was way to short. 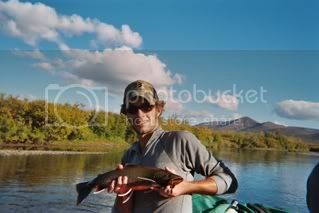 You gotta love it when you cant help but catch fish on every cast. Night like in the Beartooths - Montana is like that. Great post, Max. Good stuff! You willing to share some of your trip's logistics? your gear selection? weather? Services recommended, water craft, tent, etc. I have floated 27 different rivers in the Bristol bay drainage area over the past 17 years, and each year I try to do a new one, or two If I can pull it off. The only way an out of stater can hunt along the river is if he gets a special permit issued only in Dillingham, and you have to get the permit by the last day of August. This makes it pretty hard for an out of stater to hunt this river because Moose hunting doesn't really get good here until the 8th and later the better of Sept. I decided to float this river because it has had a couple of years reprieve from very much pressure. Air fare from Anchorage to Dillingham approx $375.00 to $400.00 rt per person. 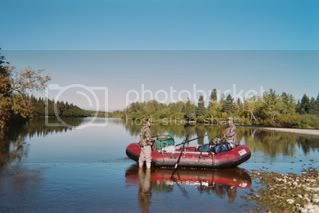 This trip I took a 14 ft Alaska Series raft, with a custom frame I built that uses two 120 qt coolers as seats. We landed on the little lake and pumped up the raft and loaded it. A very small stream leads from the lake to the main river, approx 1/3 mile. this stream in low water years would not be usable and so check it out before you go to the trouble of trying to drag your boat down the creek. It may be easier to portage your stuff overland the 1/3 mile if the creek has no water. The Main river has just enough water to float at this point, and so you may be in and out of your raft for the first miles until you get a few more tributary streams coming in to get enough flow. You start out in mostly Tundra and low hills, with Alder and some willow as the only cover. this river starts out flowing about 3 mph, and is a very easy float. After you get about 10 miles down river, you will see bigger trees, such as spruce and cottonwood, Birch. The river passes thru rolloing hills and this gives you a chance to climb up the bluffs every mile or so to Glass and look down river. This area at times shows that many Caribou travel through here, but we did not see a single Caribou in this section even though we did see old and some limited new sign. What you will see is plenty of Bear sign, and probably Brown bears. We saw Brown bears all along this river system as the Silver salmon run was very strong, and the Salmon were heavy in all parts of the river. Grayling seem to be the most abundant fish, as they are litterally everywhere. They have good size, and are more than easy to catch. This Char hit a Mepps spinner, and we caught more on Fly rods with little beads and egg pattern flies. Rainbow are really nice with plenty of the 20 inch variety and larger. Go with Egg patterns for the Rainbows too.. The further down the river you go, the higher the hills around you, and the more vegetation and the bigger the tree's, lots of Cottonwood etc. The river gains a little speed as more streams enter the main channel. This river braids very little as compared to many other rivers. There are plenty of Islands though, and good camping on these, as the bears tend to walk the channel banks insearch of easy salmon, or just moving through the country. I like to make the bears work a little if he wants to come visit my camp, so I pick Islands if at all possible. This way the bear will have to swim over to take a closer look. Most bears don't want anything to do with people and so this idea helps to keep that incidental encounter down to a minimum. I did call for moose, but found very little sign. When I found any fresh sign, I worked it pretty hard. I would camp on an island, and then paddle over to the shore and hike a half mile or so until I found a good area to call from. I used early moose calling techniques, as it was early in the rut, and the bulls were a bit timid. I called just before dark, and then again in the AM. I have had moose show up before in my camp in the middle of night if you call from your camp. This happens sometime several hours after you made your last call, so be prepared for a moose to show up as much as the next day after you call. They are not always in a hurry, and so be patient. We glassed every tall bluff and area that looked like it had a nice drainage that moose like to hang out in. We did find a Bull and a cow in one of these said small beaver dam drainages on about day 3 or 4. It was a 50'' or just a little bigger, but had only two brow tines on both sides, and was marginal moose, so we passed him up, but had fun calling him and watching his reactions to the calls. I mixed it up as we watched him, and he responded as I thought he would. He was a fairly young bull, and it was evident he was not totally convinced he was the biggest bull in the area, so he acted tough when I played the very young bull, and acted very nervous when I acted like a huge mature bull. Finally the cow had had enough of the confusion and headed out, as she was not yet ready to mate anyway..
We did see A couple or caribou, but nothing we were interested in, and we did see that one that had been attacked by ( we assume ) a bear. It ended up on a small Island about a half mile from our camp, and the bears found it that night and finished it off. We saw lots of Bears on this trip, and 3 wolves. None within range though, and they knew we were there, so no chance. The river towards the confluence of the Nushagak flows big and strong, and is used some by power boats. We never saw any, but we could see that they had been up there, as we found parts of aluminum boats that had somehow met their demise up the river. We also came onto a Sport fish camp that is used in July for Kings and Sokeye. they had Boat mooring etc. The river now has a few channels, but deep and you will encounter Sweeper , strainers, etc. Be prepared to have to cut a tree or two out if you take a smaller channel. You enter the Nushagak and Immediatly you see signs of Human activity. the Nushagak is a busy river and so your options are pretty open from here. You can be picked up via float plane about a mile below the Confluence on a straight stretch of river, or continue down river as far as you want to and be picked up by wheel plane at different locations. the King salmon river itself is about 50 miles and my GPS confirms that we traveled 52 river miles when we hit the Nush. $1,900.00 for the pickup and drop off in Dillingham. $3,400.00 for the Beaver, and we paid $375.00 per person for RT from Anchorage. We also like to spend a night in Dillingham, as I have friends there and need to see them. Good B&B's are Tai house, Beaver Creek, I like to stay at some really nice cabins that a husband and wife have. You get a free car to use when you are staying with them so that is nice to be able to go to town and eat at either the Muddy rudder or over at the pizza place, or go to the store for any last minute supplies. Email me if you want to know the name of Renee and toms cabins, as I can't remember what they call their place off hand.. sorry..
you pay about $160.00 per night for a deluxe cabin that fits like 4 to 6 people. There are Rafts you can rent over in Dillingham so that makes it nice if you don't have a raft. Tom at Bay AIr has gear at his place. He uses Sotar Alaskan model I believe. Tom and Janet have been good to us for the past several years, and Tom has an excellent flight record. Man you are making me wish I was there!!!!!!! Beautiful pics & well written report.